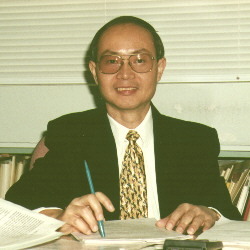 Kam-tai Chan received his Ph.D. from Cornell University in Applied Physics in March, 1986. His thesis research involved the preparation of ultrathin compound semiconductor materials for optoelectronics and quantum-size effect devices. He was sponsored by General Electric Company to stay on at Cornell University as a Postdoctoral Research Associate to work on high power lasers and integrated photodetectors. He joined Hewlett-Packard Company in July, 1986 at its Microwave Technology Division. He participated in projects that eventually led to the production of 33 GHz PIN photodetectors and 70 GHz High Electron Mobility Transistors. In 1989 he was invited by Lawrence Berkeley Laboratory of the University of California at Berkeley to serve as a Visiting Industrial Fellow to develop industrial applications of the extensive sophisticated instrumentation in the Laboratory. He resigned from Hewlett-Packard at the end of 1991 to assume his present position at the Chinese University of Hong Kong. Semiconductor lasers, integrated optics, quantum-size effect devices, optical switches and modulators, fiber ring lasers, fiber Bragg gratings and their applications, soliton transmission and DECT wireless communication. D. Fekete, K.T. Chan, L. Eastman, J.M. Ballantyne, 'Graded-index separate-confinement InGaAs/GaAs strained-layer quantum well laser grown by metalorganic chemical vapor deposition', Appl. Phys. Lett. 49, 1986, 1659. G.G. Zhou, K.T. Chan, B. Hughes, L. Studbaker, 'A pseudomorphic MODFET structure with excellent linear power performance at mm-wave range', International Electron Device Meeting, Washington, D.C., December 1989. K.T. Chan, M. Lightner, G. Patterson, K.M. Yu, 'Growth studies of pseudomorphic GaAs/InGaAs/A1GaAs modulation-doped field-effect transistor structures', Appl. Phys. Lett. 56, 1990, 2022. K.T. Chan, C. Kirschbaum, K.M. Yu,'Analysis of GaAs/InGaAs/A1GaAs modulation-doped field-effect transistor structures by secondary ion mass spectrometry and ion channeling', Appl. Phys. Lett. 58, 1991, 1305. K.T. Chan, Y.W. Hui, D.J. Han and G.H. Li, 'Modification of Refractive Index of GaAs by Ion Implantation of Oxygen', Nuclear Instruments and Methods in Physics Research B83 (1993) pp.177-180. Y. Zhao and K.T. Chan, 'Analysis of Modulational Instability in Monomode Optical Fibres with High-Order Nonlinearity', Journal of Modern Optics, 1993, Vol.40, pp.1995-2007. C.S. Qin, G.C. Huang, K.T. Chan and K.W. Cheung, 'Low Drive Power, Sidelobe Free Acousto-optic Tunable Filters/switches', Electron. Lett. Vol. 31(15), pp. 1237-1238, 1995. Han Dejun, K.T. Chan, Li Guohui, Wang Wenxun and En-Jun Zhu, 'A SI/n+ Structure in Semi-insulating GaAs Substrate by High Energy Implantation', Nuclear Instruments and Methods B, Vol. 100, pp. 65-68, 1995. Y. Zhao and K.T. Chan, 'Transmission Equations for Soliton Amplification in Erbium-doped Optical Fibers', Microwave and Optical Technol. Lett., Vol. 9, No. 3, pp. 164-170, 1995. Han Dejun, K.T. Chan, Li GuoHui, Wang WenXun and En-Jun Zhu, 'A Novel MESFET Fabricated by a Simple Internal Interconnection Technique', IEEE Transactions on Electron Devices, Vol. 42, No. 2, pp. 370-372, 1995. Ding Hao and K.T. Chan, 'Solving Planar Dielectric Waveguide Equations by Counting the Number of Guided Modes', (accepted for publication in Feb. 1997 issue of Photonics Technology Letters). Shenping Li, Ding Hao and K.T. Chan, 'Configuration of Erbium-doped Fiber Lasers for Dual-wavelength Operation', (accepted for publication in Electronics Letters).